The House of Loreius Tiburtinus (Also called the House of Octavius Quartio) is renowned for its meticulous and well preserved artwork as well as its large gardens. It is located in the famed Roman city of Pompeii. It, along with the rest of Pompeii was preserved by the volcanic eruption of Mount Vesuvius on August 24, 79 AD. The House of Loreius Tiburtinus is particularly well known for its extensive gardens and outdoor ornamentation. 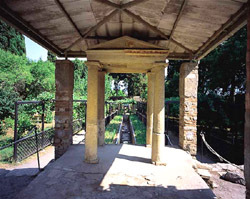 Beyond the summer triclinium there was a specific arrangement of two Euripi, a decorative type of fountain. These fountains were the centerpiece for many frescoes and statuettes. The upper Epirus has a strong significance to the excavated city of Pompeii because its decorative frescoes are the source of the only known artist's signature: "Lucius pinxit" or "Painted by Lucius." These frescoes portray the myths of Narcissus on one side of the fountain and Pyramus and Thisbe on the other. The other lower Euripus is a fountain that spans the long garden which holds numerous types of foliage including various fruit trees. All of these fountains operate using a technology called castellum plumbeum, a fairly complex water pressure system which functioned with the local water towers, providing to several locations.